At this year’s Milan furniture fair, which opens on Tuesday, designers and brands are playing a cautious game. While some British companies (among them Established & Sons, Lee Broom and SCP) are choosing not to exhibit this year, perhaps due to political and economic uncertainty, other design houses are plundering archives to reissue classic furniture, or simply adding new colours or materials to existing lines. Sustainability and recycling are key. But as well as looking after the planet, we’re looking after ourselves: colours and silhouettes are warmer, softer and rounder this year. Are we in need of a bit of comfort these days? Probably. Paris-born, London-based architect, coding expert and lecturer Arthur Mamou-Mani is the creator of this year’s Cos installation, shown at the 16th-century Palazzo Isimbardi from tomorrow. Inspired by the forms of Gaudí arches, three interconnected domes creep from a central courtyard, into the palazzo and straight on to the peaceful garden. Exit points along the way allow visitors to examine the structure up close from within, then step outside to see the grander vision as a whole. The installation is then built from “biobricks” – a newly developed 3D printed form made from bioplastic. In its raw form, this is a clear pellet made of glycerine, vinegar and starch. For the installation in Milan, a wood version is made from a pulp added to the bioplastic mix. “It’s a fully renewable material,” Mamou-Mani says. The installation’s name, Conifera, references the Douglas fir trees that are a part of that mix. Mamou-Mani graduated from the Architectural Association School of Architecture in London in 2008, then worked for Zaha Hadid and Jean Nouvel before going solo in 2011. His east London studio is also home to his own digital fabrication laboratory called FabPub which contains a vast robotic 3D printer. This lab, along with others based around Milan, has been working full pelt to create the 700 biobricks for Mamou-Mani’s installation. Ini Archibong Curve sofa in orange. Taking cues from fashion, there’s a satisfying palette of warm tones that feels very earthy. Think burnt orange and mustard yellow, with burgundy and peach. 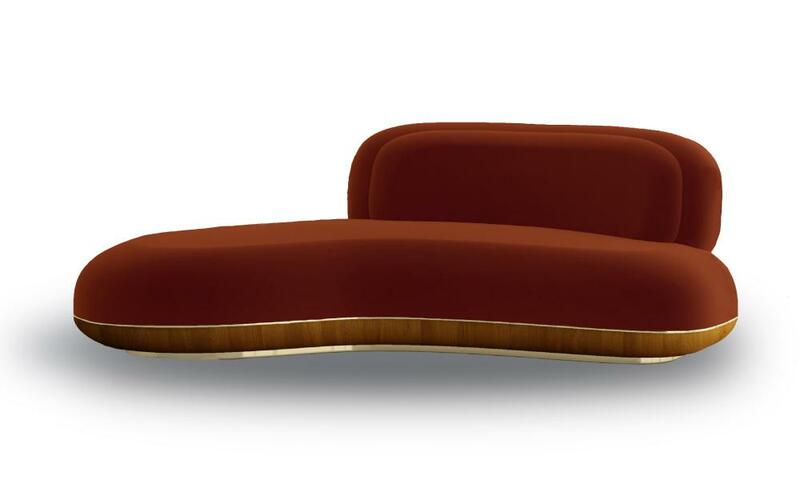 Nice examples to be shown in Milan include a rich velvet marmalade-coloured sofa by the much-in-demand US designer Ini Archibong for British brand Sé. Watch out, too, for a smoked cast-glass lamp, which rests on an anodised brass back, created by the Hong Kong-based architect André Fu who is launching his first lifestyle collection at the fair. 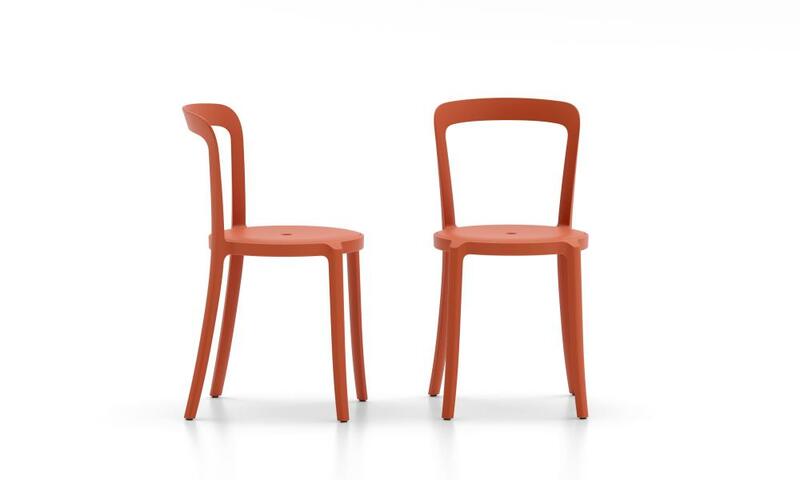 The On and On chair by Barber & Osgerby for Emeco. Edward Barber and Jay Osgerby – best known for their London Olympic torch – are working with American furniture brand Emeco for the first time this year. The company, which launched in 1944 and has worked with recycled aluminium for decades, has enlisted the British award-winning duo to create a new series with recycling in mind. The On and On chair, bar and stools are made from mostly single-use plastic bottles with fibreglass added for strength. The chair can be returned to Emeco for recycling into a new version. The Manzoni restaurant by Tom Dixon. Last year Tom Dixon stayed away from Milan and focused on the launch of his vast new headquarters, showroom and restaurant at the newly opened Coal Drops Yard in King’s Cross. This year he’s back. 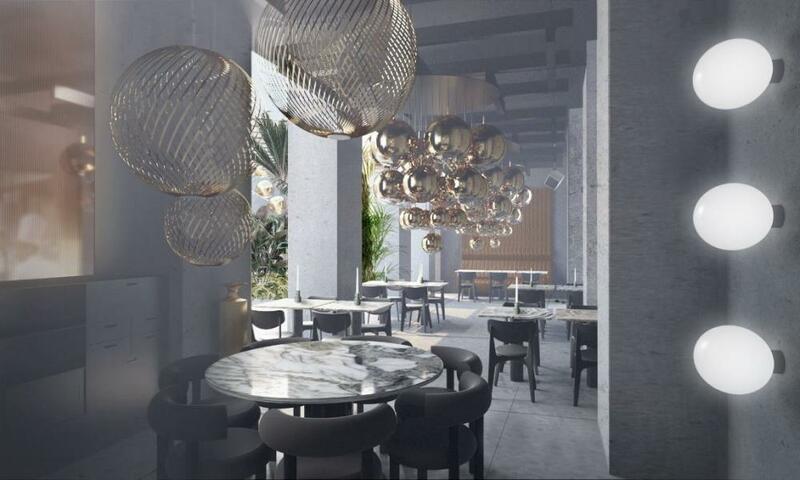 He’s opening a new 100-cover restaurant, the Manzoni, which will also house a showroom. His aim is that visitors will “slow down and experience our products in a live setting”. Dixon will also be showing new designs, including the Fat chair range, Spring – a series of stainless steel pendant lights – and the Opal translucent globe lights. Luke Edward Hall design for Richard Ginori. London-based illustrator and designer Luke Edward Hall has teamed up with the venerable Italian porcelain producers Richard Ginori (founded outside of Florence in 1735) to create a collection entitled Il Viaggio di Nettuno – The Journey of Neptune. 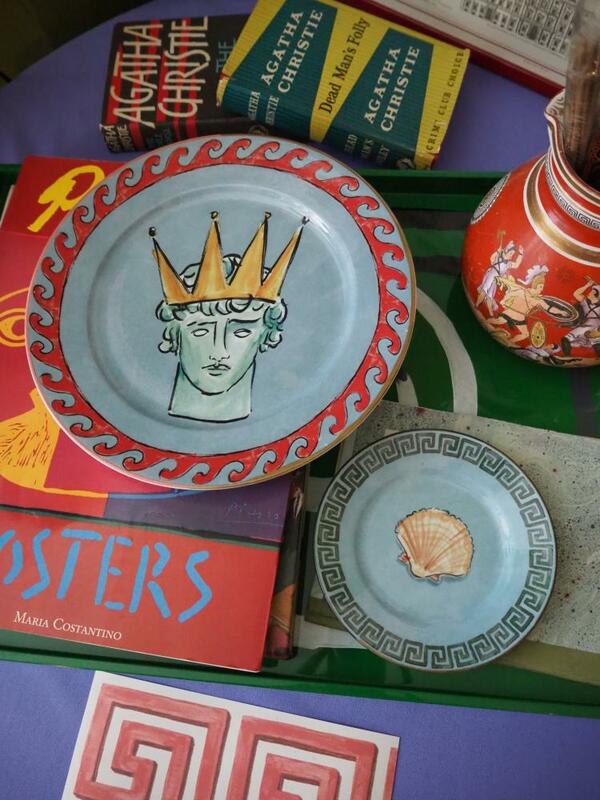 Inspired by Hall’s great love of Roman mythology, expect a delightfully whimsical series of plates, teacups and vases with fantastical stories of ocean winds, billowing cloaks, chariots pulled by seahorses and even a merman playing a golden lyre. Designers Draga & Aurel are at the fair for the second time, with a space-age show of retro-futuristic shapes and colours, based around transparency. Their Judd lights are a standout in rich shades. 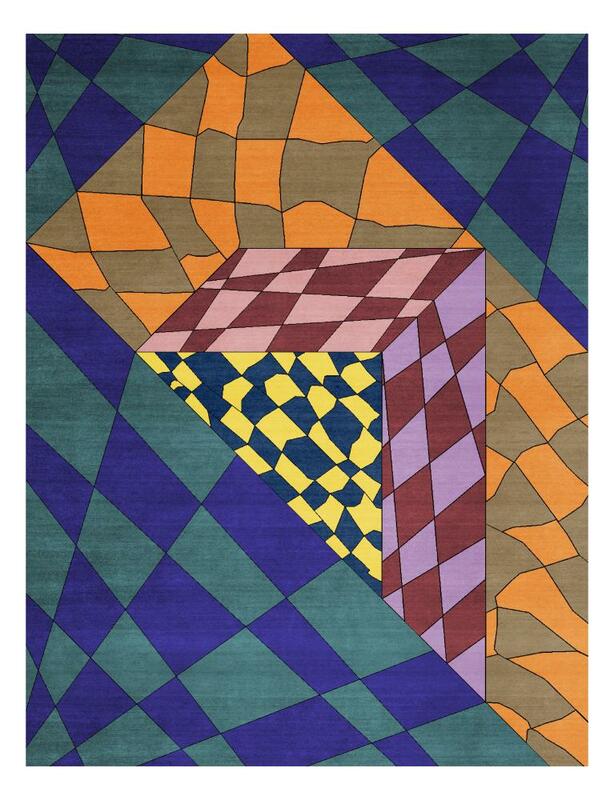 Martino Gamper design for CC-Tapis. The Milan-based rug company CC-Tapis is known for collaborations with designers such as Patricia Urquiola, Bethan Laura Wood and Faye Toogood which result in experimental and technically challenging floor coverings. Every rug is hand-knotted in their Nepalese workshops by Tibetan artisans. This year they’re working with a new selection of makers on Spectrum – Killer Knots from Outer Space. It’s all futurist eclecticism from the likes of David/Nicolas, Maarten De Ceulaer and Studiopepe. There’s also a standout new series by designer Martino Gamper, Xequer, based on chessboard shapes, hot colours and twisted lines. 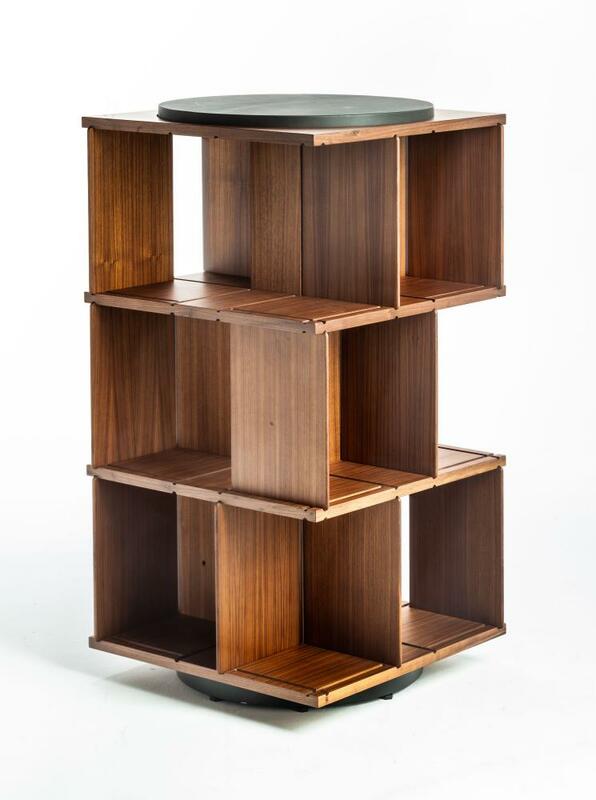 The madly beautiful Turner Bookcase by Italian architect Gianfranco Frattini is a re-edition of his Model 823, first produced in 1963 for the Italian house Poltrona Frau. Frattini, a student of Gio Ponti, was ahead of his time with this: a three-level swivelling structure constructed with grooves that behave as rails so you can add or remove dividing panels. The central column of birch plywood has a walnut veneer, as do the divider shelves. The bookcase’s top has a leather-covered circular rotating piece. It’s compact and adaptable – a good fit for modern living. A table from Mater’s Ocean Collection. These days ethical brands are looking for new ways to refine work with recycled materials. 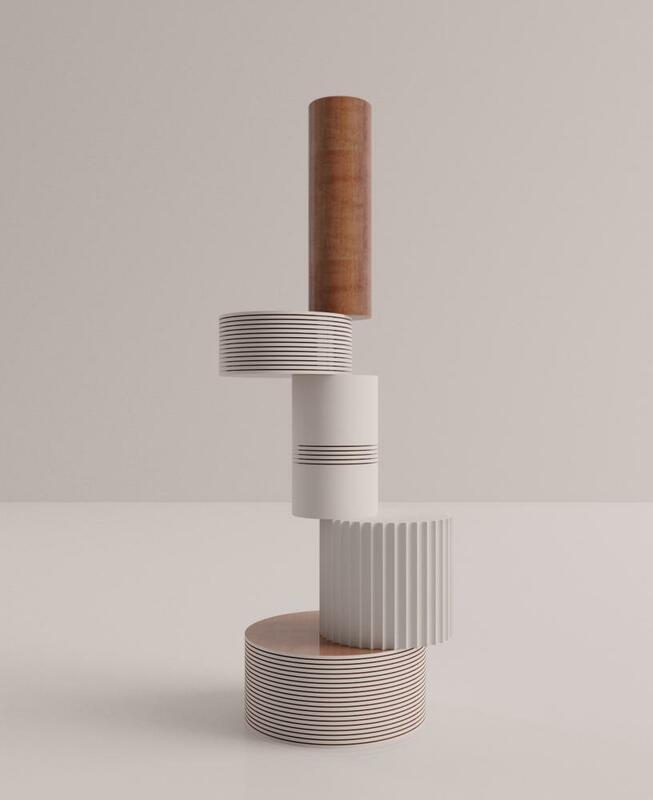 Nice, then, to see the 13-year-old Copenhagen brand Mater launching its Ocean Collection by collaborating with the granddaughter of the iconic mid-century designers Jørgen and Nanna Ditzel. 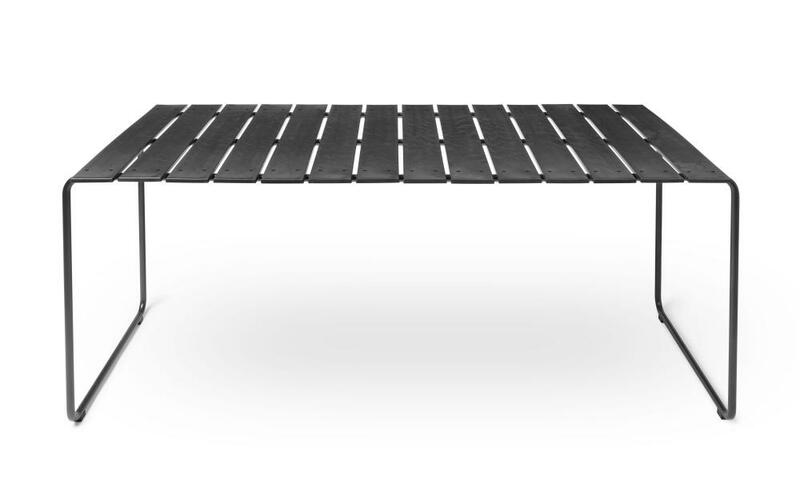 What was a classic 1955 table and chair made with a steel frame and timber veneer has been reimagined using 960 grams of ocean plastic waste made from discarded fishing nets. For today’s larger proportions, the designs have been increased in size, but other than that, they remain unchanged. 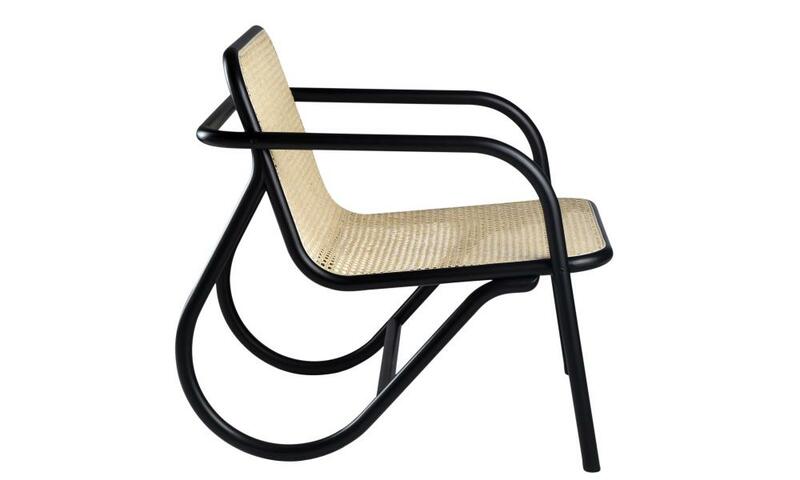 Lounge chair by Michael Anastassiades. Woven cane is back in a significant way. For the style, think of the Bauhaus classic Cesca chairs designed in 1928 by Marcel Breuer and produced for Thonet and later Knoll. Gebrüder Thonet Vienna, as it’s now known, is launching a new lounge chair, the N.200, designed by the London-based, Cyprus-born designer Michael Anastassiades. He has stuck with the company’s traditional construction techniques to make the curved wooden structure, and the chair, with its woven seat and back, feels at once simple and light. British designer Bethan Gray has joined forces with Nature Squared, specialists in working with sustainable natural materials, to create a new furniture collection inlaid with scallop and oyster shells, and pheasant feathers, all from industrial, farming or food waste. Key pieces include bucket chairs, a coffee table, freestanding shelves and a side table. Italian ceramic specialists Bitossi are launching new vases by the Milan architectural practice Quincoces-Dragò. 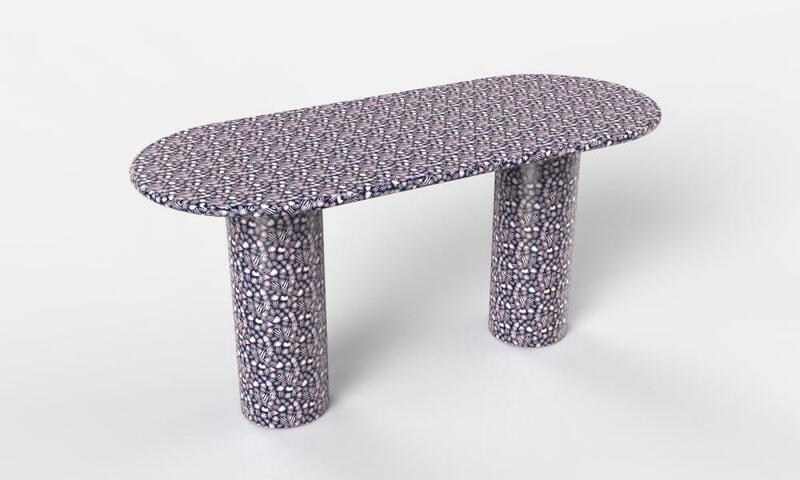 The collection – all clean lines and sculptural forms – has a lot in common with the work of Ettore Sottsass and Nathalie Du Pasquier (founders of the Memphis Group) who have also produced pieces for the company. These works are available in a soft, natural colour palette.